Literally, the worst case scenario. Is Phil Jackson really going to buy out Carmelo Anthony’s contract?. I mean we all know Carmelo has expressed that he wants to stay in New York and win a championship here. But realistically, that will be extremely hard. Why? Because of Phil freaking Jackson. Phil Jackson is the absolute worst. I love Carmelo with everything in me. I appreciate everything he has done for the Knicks. He help bring us to relevance again. He brought us back on the map. 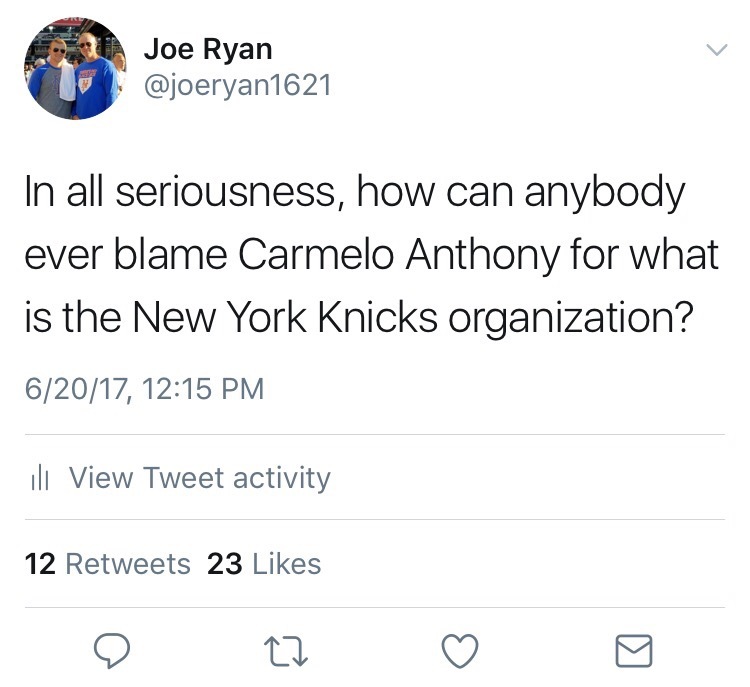 It’s not his fault that Phil Jackson came in a ruined what Carmelo was building. Last years team had a chance to be special, and a chance at a playoff berth, but Phil Jackson is terrible at management and couldn’t get a grasp on the team. 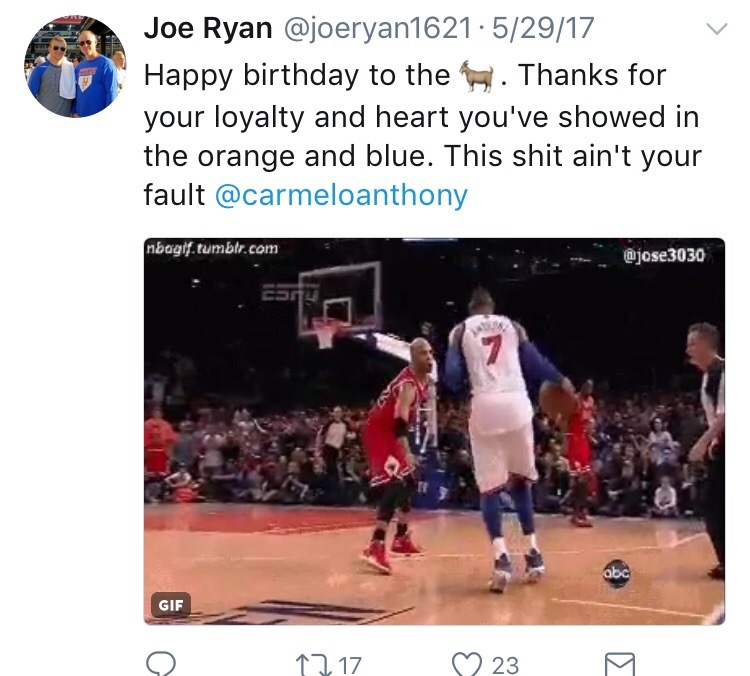 So for obvious reasons, Carmelo is getting frustrated he is getting older, he wants to continue to build his legacy and he wants to win a ring. Is there anything wrong with that? Of course not. But if the Knicks have to buy him out, I’m going to protest outside MSG. Whoever wants to join me you can, just hit me up on Twitter (@joeryan1621). Just click the link to get to my page. Let explain why this will push the Knicks back years if the Knicks buy him out. Stay with me here. If the Knicks were to buyout Carmelo that means we get nothing for Melo. Nothing. Nada. Nope. Not a single thing. We won’t get any picks, any players. Nobody. Can you imagine if a team just got rid of their best player for nothing? Well that’s what the Knicks are looking at here. The Cavs are obviously the front runners to land Carmelo if the Knicks buy him out, that’s obvious. And I know the Knicks are not in any situation to contend with the Cavs but if they get our best player for free they have to give us something in return. The Cavs won’t have the money to sign Melo unless he’s bought out. So what will happen is the Knicks pay Melo the rest of the money on his contract and the Cavs will sign Melo to the leagues minimum. Melo still gets all of his money, Cavs can contend with the Warriors, Melo has a chance at a title and the Knicks get nothing. Typical. That can’t happen. Either the Cavs eat part of Melos contract, or as much as they could or they give us picks and/or players. The Cavs have to agree to the similar situation when LeBron left for Miami. LeBron left as a free agent but the Cavs got picks in return because of a sign and trade. 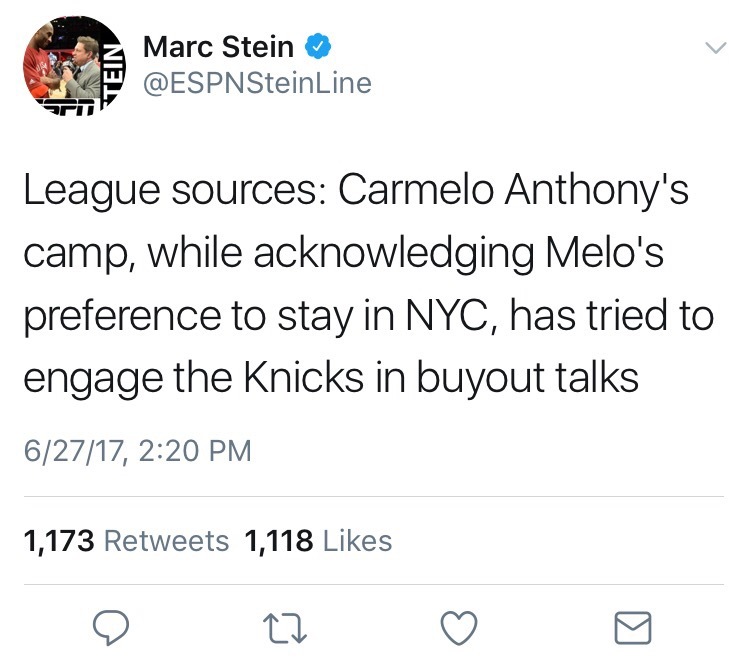 Only way the Knicks can let Carmelo leave is if the Knicks get picks in return. 2 first rounders and a second rounder at least. If not this can set the Knicks back multiple years. I honestly think the Knicks can get to the playoffs this year. KP is only getting better, Carmelo is still a star, Willy Hernangomez was just awarded first team all rookie and Frank Ntilikina looks like the real deal. With the Eastern Conference getting much weaker, the Knicks have a shot at the playoffs this year. A good shot actually, if Melo stays. But again, if Phil Jackson is still the most stubborn man in the world and wants Melo off this team for nothing, I swear I’ll go nuts. This team needs Melo. Players look at him as a leader and just because Phil Jackson doesn’t want him doesn’t mean that other don’t. If the Knicks buy out Melo, and the Knicks get nothing, we riot and protest and we get Phil fired. It’s amazing to me how he still has a job. Next Post: Phil Jackson fired; LaLa Anthony back in the fold; are the Knicks back?